Low-efficiency cars could be hit with a congestion charge of £25 under tough new measures announced by London mayor Ken Livingstone. Under the plans, which went out to public consultation on Friday, cars which produce larger amounts of CO2 will pay charges above the current £8. The highest-polluting vehicles account for about 8% of London-registered cars. The London Assembly Conservatives said the mayor was "using the environment as cover for raising revenue". 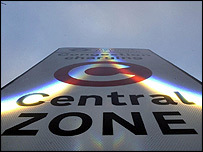 Congestion charge spokeswoman for the London Assembly Conservatives, Angie Bray, said: "This will achieve a negligible effect on carbon emissions in London. "The biggest contributor to carbon emissions in London is the stationary traffic, caused by the chronic jams, made worse by the mayor's constant meddling with traffic lights, road humps and bus lanes. "This is nothing more than rather expensive gesture politics, using the environment as cover for raising revenue." Joe Macari, who runs a central London Ferrari and Maserati dealership, said the new charge would damage businesses and unjustly penalise the wealthy. He said the charge could end up costing his customers as much as £6,500 a year. He said: "They're already working harder to afford the things they want to afford, why should they be penalised for being successful? "It's just going to hurt British industry." But Mr Livingstone said the hike was intended to reflect those vehicles "that make the biggest contribution to global warming". He said: "Londoners are becoming increasingly aware of the need to tackle climate change and this summer's floods were a reminder of the urgency with which we need to reduce CO2 emissions. "The highest CO2 emitting cars - like some of the so-called Chelsea tractors, high-powered sports cars and luxury executive cars - can produce twice as much carbon dioxide as the kind of car driven by the average Londoner." He said the charges would only apply to those driving within the congestion zone, which was recently extended into west London. Most road users would be unaffected by the new charges and the least polluting vehicles would not have to pay the congestion charge at all, he said. The vehicles that would fall into the £25-a-day category are those in vehicle excise duty band G, which produce 225g of CO2 per kilometre, and vehicles with engines larger than 3,000cc that were registered before March 2001. The consultation lasts until 19 October, and if approved the £25 charge could be in place by October 2008.